Claudia Robles-Angel is an interdisciplinary artist born in Bogotá-Colombia, currently living in Cologne-Germany and active worldwide. 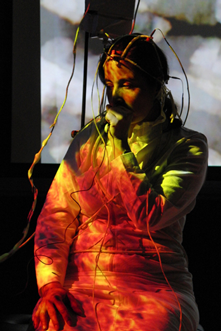 Her work and research cover different aspects of visual and sound art, which extend from audiovisual fixed-media compositions to performances and installations interacting with bio-data via the usage of interfaces such as, for example, the EEG (electroencephalogram, measuring brain waves activity). Her work is constantly featured in not only media and sound-based festivals/conferences but also in group and solo exhibitions around the globe, for example, the ZKM Center in Karlsruhe; KIBLA Multimedia Centre in Maribor, Bauhaus Museum für Gestaltung Berlin, the International Computer Music Conferences ICMC in Copenhagen, Montréal and Utrecht (2007/2009/2016); Festival Internacional de la Imagen in Manizales (2009/2010/2013), Museo de Arte Moderno and ESPACIO Fundación Telefónica in Buenos Aires (2010), DRHA2010 Festival of Sensual Technologies in London (2010), the New York City Electroacoustic Music Festival NYCEMF (2010/2013-2016); the SIGGRAPH Asia in Yokohama (2009); the Re-New Festival in Copenhagen (2011); the New Interfaces for Musical Expression Conference NIME in Oslo (2011); ISEA 2011 Istanbul, at 55th Venice Biennale Prohelvetia – Salon Suisse (2013), Audio Art Festival Cracow (2013), CMMR Symposium on Computer Music Multidisciplinary Research in Plymouth and Marseille (2013/2015), at the Museum of Contemporary Art Bogotá (2008/2015), at MADATAC 07 Madrid (2016), Sound/Image colloquium in London (2016), IK Stichting Vlissingen (2016), at Harvestworks Digital Media Arts Center New York City (2014/2016) and more recently at Digitale Duesseldorf.